I am publishing a technique for process automation, in hopes for cost savings to manufacturers in America and abroad. I believe that by implementing Intelligent License Plates, supply chain businesses will benefit and hopefully save on operating costs. Whether we want to believe it or not, a lot of people will buy the cheapest products that suit their taste. Period. We believe our technique will allow companies that run poorly in meeting a customer’s needs to utilize Intelligent License Plates. In barcode scanning for warehousing and manufacturing, one size rarely fits all. A workflow for a process that works for one organization may be cumbersome or viewed as overkill for another. The variables involved in optimizing an organization’s processes are often too complex to assume one workflow fits all. Even within one organization, the optimal workflow of automation required may vary greatly by time, date, sales region, customer, user, products, or locations. Variables such as workforce enablement (trusted or not trusted operations), volume, product variability, and probability of outcomes during an operation are all important factors in tailoring a solution that works right. A standard license plate is a unique tag or label that can be identified by a scan or RFID read. It represents a multitude of information about a collection of items associated with this license plate. Information such as items, lot numbers, serial numbers, and unit of measure (UOM) are examples of a collection of items. The concept of an intelligent license plate takes this concept and goes further by incorporating the state of the license plate in the process (some examples are new, just received, just put away, just produced, just picked, just shipped) and combines it with the context of a scan which includes, what part of the application the scan occurs and who did the scan. This optimizes labor and automation in a unique way. This technique optimizes operational processes around the most likely outcomes by removing the burden of focusing on exceptions. Exceptions, while a reality in day to day work, should not hinder the speed of the most probable outcomes. Intelligent license plating creates a workflow plan for a class or set of behaviors for license plates that automates certain tasks based on what state the license plate is in, what operation is being used, and who is doing the operation. 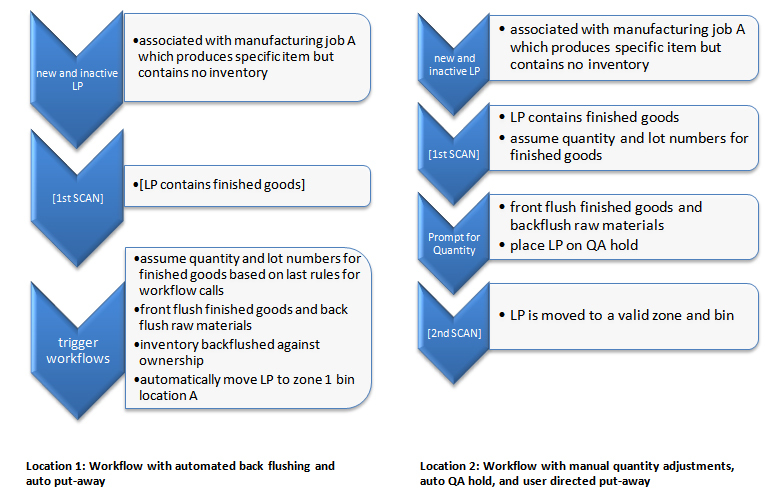 Before a product is manufactured, an operator can create a workflow that defines what should happen when someone in manufacturing scans a new license plate associated with this specific workflow. To better explain intelligent license plates, an example seems appropriate. A food manufacturing company produces pallets of finished goods in 2 different manufacturing locations. In one location, they wish to produce products that have very low variance from pallet to pallet. Because of this low variance in the finished goods and raw materials, they decide to automatically create the finished good and back flush the raw materials. In addition, they always move these pallets into a pre determined location for order fulfillment in a specific zone. In a second location, they produce products that have high variance from pallet to pallet and have a need to do a quality assurance hold until results are tested. In this location, pallets can be placed into a variety of zones. If a supervisor scans a license plate while a license plate is new and it exists in the manufacturing location, they would like to automatically assume that the supervisor wants to review the license plate and potentially change its hold status. To automate both of these processes, this company would create 2 license plate workflows. CTO/Founder of Appolis, Inc. A software development company in manufacturing and distribution with a focus on Mobile solutions. Does the LP replace the UPC barecode scann? We have recently gotten away from labing single parts with a label which we do a true one piece pick per order, now if feels like we will have to start labeling again.